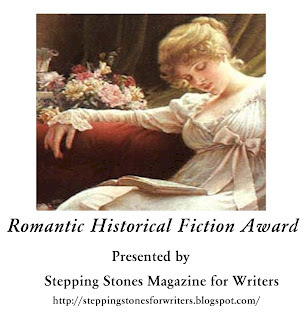 just contacted me to say I'd been awarded the Romantic Historical Fiction Award. what people will think of a new book. I’ve got a new book releasing February 1st. It’s book three in my Lassoed in Texas series. And find Mary's historical Golden Days. 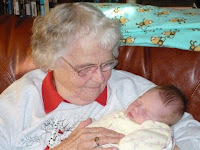 I took my mom to Omaha on Saturday to meet her first great-grandchild. Elle slept some, ate some, cried some. she performed brilliantly, all the tricks an almost two-week-old knows. My mom is the grandmother of 28. I think that's the current count. 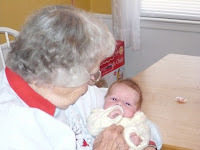 But now she's starting a new phase, great-grandmotherhood. The numbers could grow exponentially. And that's okay because my mom has a capacity for love that is unparallelled. to my mom, Dorothy Moore. 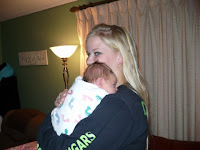 I had to throw in one snapshot of me and Elle, too. A new blog I've found that connects the writer to the reader in a cool way. I got this from Barbour. The press release for Gingham Mountain, coming in February to a bookstore near you. 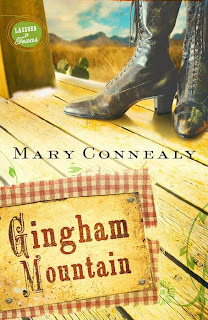 Love derails a woman's best-laid plans in Gingham Mountain, another humorous historical romance by author Mary Connealy. The third book in the Lassoed in Texas series, Gingham Mountain is set to release in February 2009. When Hannah Cartwright meets Grant, a disreputable-looking wrangler, she's determined to keep him from committing two orphan train children to hard labor on his ranch. How long will she have to play the role of schoolmarm before she gets a chance to rescue the children? Prudence, the town dressmaker, has designs on Grant. Will she succeed in securing his affections? As Grant struggles to run the ranch and raise six orphans, he finds love making tracks to his heart. Will he be caught in a web of deceit or lassoed by the love of one good woman? Enjoy this novel full of humor and romance from Mary Connealy, an award-winning author, who lives on a Nebraska ranch with her husband and is the mother of four grown daughters. She is the author of Petticoat Ranch and Calico Canyon. 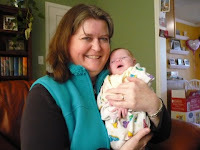 Also an avid blogger, Mary is a GED instructor by day and an author by night. I'm not going to be one of those grandma's who bores everybody with minor details about her beautiful, precious, sweet, innocent, perfect grandchild. But when something BIG happens, then YEAH, sure I'm going to write about that. I thought this was worthy. Have you ever noticed that, at first, when a baby is very first born, you say, "She's two hours old, she's twelve hours old. Then a day passes and you switch to, "She's two days old. She's five days old." Then they start saying, "She's two weeks old, she's six weeks old." Eventually that morphs into, "She's six months old, she's eighteen months old." About the time they turn two it starts to be 1/2 years. "She's four and a half." This ends about school age and is only years. "She's six. She's ten." You know you're getting old when that drops to DECADES. He's in his forties, sixties, eighties. Well, Elle is ONE WEEK OLD TODAY. Here are ten questions for you to answer in the comments section or just for yourself. Reflecting on where we've been will give us a better perspective of where we want to go in 2009. 1.. What went really well for you in 2008? 2.. What did you do that you’re proud of? 3.. Who have you helped out? 4.. How have you grown and developed in your profession? 5.. How have you grown and developed with co-workers? 6.. Who has really appreciated your work? 7.. Who has helped you out and been there for you? 8.. Who have you admired in 2008? 9.. What have been some fun moments in 2008? 10.. Which 5 things from 2008 would you like to have more of in 2009? More details over on Petticoats and Pistols. 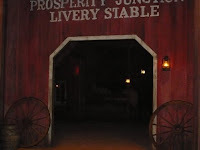 A 1900 Western settlement in the Cowboy Hall of Fame in Oklahoma City. 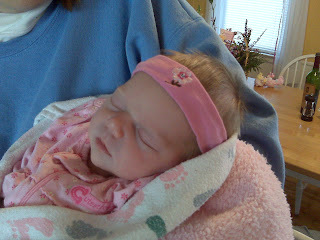 Baby Elle (one syllable, rhymes with Shell), born just today. Wide awake. Many More Pictures to come!!!!! which is coming in February. A really special giveaway on Seekerville on Monday. Crystal Laine Miller, a professional freelance reader will be our guest. "Dare Your Reader to Risk Reading Your Book"
The drawing will take place on Wednesday, January 14.
your manuscript's first three chapters and synopsis. Saturday Jan 10: Tina Russo shares on writing romantic fiction for Woman's World Magazine. Keep an eye out for her latest Woman's World story, Letting Go, which is on newsstands RIGHT NOW!! We are starting 2009 with a bang in Seekerville. Friday Jan 9: Myra L. Johnson on the Christian nonfiction market. In addition to her multiple fiction sales in 2008 (Heartsong and Abingdon), Myra is also a nonfiction writer. Thursday Jan 8: Abingdon Press Senior Acquisitions Editor for Fiction, Barbara Scott, is back for an Encore, Encore!! Saturday Jan 10: Tina Russo shares on writing romantic fiction for Woman's World Magazine. Keep an eye out for her latest Woman's World story, Letting Go, which is on newsstands RIGHT NOW!! We are starting 2009 with a bang in Seekerville. Anyone who comments all six days will be entered into a drawing for a $25.00 Amazon Gift Card. If you're interested we've got something special and a special prize to give away, too. Anyone who comments all six days will be entered into a drawing for a $25.00 Amazon Gift Card. Wednesday Jan 7: Michael Bracken on writing for the Confessions. Michael is a phenom in the confession world and we are thrilled to have him stop by and share. Tuesday Jan 6: Cindi Myers on the working writer. If you don't know Cindi, check out her Market News Yahoo Group or her website for news on her latest release A Man To Rely On, from Super Romance. Monday Jan 5: Deb Ng on professional blogging. Deborah Ng is the genius behind Freelance Writing Jobs. The next installment in Connealy's Lassoed in Texas series is a delight. It's filled with joy, love, tenderness, a lot of laughter and characters who grow in their faith. Readers will be happily reunited with some of the characters from Petticoat Ranch, the first book in the series. Summary: In 1870 Texas, rancher Grant knows what it's like to be an orphan and have no one care about you. He takes in unwanted orphans and tries to give them a home where they will know love and kindness. When schoolmarm Hannah accuses him of being a cruel ranch owner who only wants the children as laborers, Grant is speechless. He has to prove to Hannah he has only the children's best interests at heart. This may prove harder than he thought, since he's attracted to Hannah in spite of her accusations. But Hannah doesn't want to listen to what Grant says. She still believes the children are in danger and she's the only person who can save them. I can't use the remote in a hotel room because I don't know what the last person was doing while flipping through the channels. must send my special thanks to whoever sent me the one about poop in the glue on envelopes because I now have to use a wet sponge with every envelope that needs sealing. Also, now I have to scrub the top of every can I open for the same reason.I no longer have any savings because I gave it to a sick girl (Penny Brown) who is about to die in the hospital for the 1,387,258th time. I no longer worry about my soul because I have 363,214 angels looking out for me, and St.Theressa's novena has granted my every wish. I no longer answer the phone because someone will ask me to dial a number for or which I will get a phone bill with calls to Jamaica , Uganda , Singapore and Uzbekistan. I can only hope that 2009 is half as great.